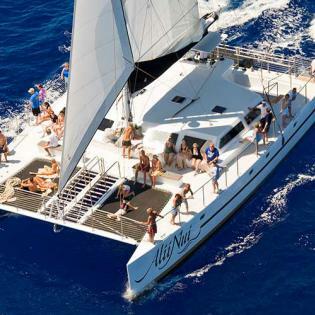 If you are looking for the royal treatment at an affordable price on your snorkeling adventure, look no further than Maui Dive Shop’s 65-foot luxury sailing catamaran, Alii Nui. 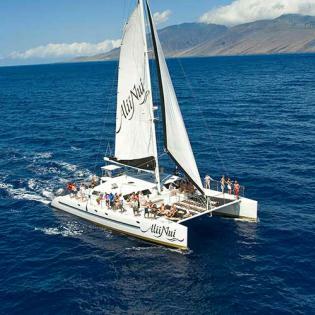 Step into the lap of luxury, beginning with a fresh and flavorful continental breakfast, followed by a relaxing cruise to one of Maui’s premiere snorkeling spots. Alii Nui’s deluxe masks, snorkels, and fins are all included, along with wetsuit tops, boogie boards, and even personalized instructions. The Alii Nui features four easy entry points, as well as an express land for those that simply cannot wait to jump into Maui’s beautiful waters. Guests can join in on a guided snorkel safari and see breath-taking coral reefs, complete with tropical fish and endangered green sea turtles. 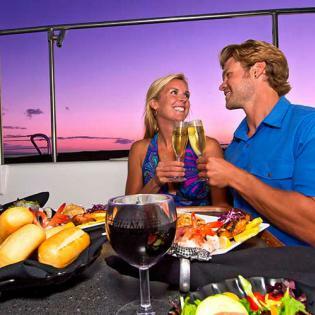 After returning to the catamaran, guests are invited to rinse off with a heated, fresh water shower and enjoy a lunchtime feast fit for royalty. 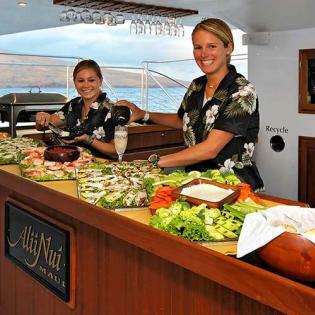 The Alii Nui is also available for romantic sunset sails, allowing guests to experience the dazzling show of colors in the Maui sunset, while enjoying delicious appetizers and cocktails.